Discussion in 'Politics' started by exGOPer, Jan 16, 2018. • Food stamp use ranking: Kentucky has the 10th-highest food stamp use-percentage in the U.S.
• Food stamp use ranking: D.C. has the highest food stamp-use percentage in the U.S.
• Food stamp use ranking: Georgia has the eighth-highest food stamp use-percentage in the U.S.
• Food stamp use ranking: Arkansas has the 16th-highest food stamp use-percentage in the U.S.
• Food stamp use ranking: Louisiana has the seventh- highest food stamp use-percentage in the U.S.
• Food stamp use ranking: New Mexico has the third-highest food stamp use-percentage in the U.S.
• Food stamp use ranking: Mississippi has the second-highest food stamp use-percentage in the U.S. But blue states can have high poverty too right? California with his expensive housing and high standards of living means many are not able to afford good housing. So let's look at other measures like Human Development Index rankings. On the low end of the scale it's Mississippi. They rank just 3.81 out of 10 with an average life expectancy of 75, 76% of the student aged population (3-24) are in school and only 12% with a bachelor's degree. Just 7% of the state have advanced degrees and 19% have less than a high school education. That state is run by Republicans except for one Democrat in the House of Representatives. And guess who are on the top and who on the bottom? You will be amazed! Buzzfeed style! As it happens, the high-tax states also tend to be the wealthiest states – and also blue states in presidential elections. Under this particular provision, one could perhaps make the case that they are being subsidized by low-tax states. But when you step back and look at the total revenue and spending picture, blue states could make the case that they are subsidizing other states, as various reports show they receive far less in federal spending than they pay in federal taxes. A report released on Oct. 3 by the New York State Comptroller said that New York generated 9.4 percent of the federal government’s income-tax receipts, even though it represented 6.1 percent of the U.S. population. It received 5.9 percent of federal spending allocated to the states. According to the report, New York contributed $12,914 per capita in tax revenue to the federal budget — but received $10,844 in per capita federal spending. The problem has only gotten worse in the three years since the report was last produced, state officials said. “In New York state, the idea that we are being subsidized by other states holds no water,” Deputy New York Comptroller Robert Ward said in an interview. Another report, released in September by the Rockefeller Institute of Government, had similar findings. Rockefeller calculated that New York made payments of $12,820 per capita, or $3,401 higher than the national average, while federal spending in New York was $10,395 per capita, $329 lower than the U.S. average. 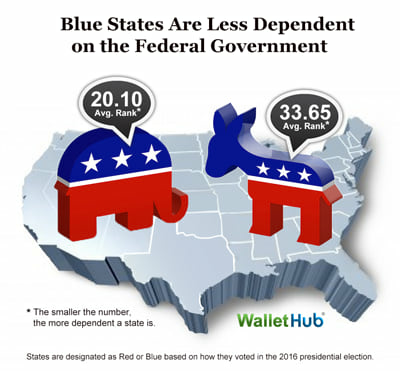 Yet another calculation was done by the financial website WalletHub, which shared its calculations of the mismatch between federal taxes contributed by states and the federal spending received. Again, the wealthier, bluer states tended to fare worse on their return on taxes paid. "Even a military base, usually considered the biggest, juiciest pork chop that a state can hope for, doesn’t change the spending-to-tax ratio more than a penny in a medium-sized state." So what, they work hard and pay taxes as much as those in blue states. Wrong again! Which brings us to the real culprit: high blue-state income taxes. States with the highest incomes per capita — and they’re all solid blue — pay much higher federal taxes per capita. An income of $132,000 in San Francisco buys the same standard of living as $71,000 in Phoenix, but when it’s time to fill out the 1040, the San Francisco family pays 17.3 percent of its income in federal income taxes. That’s $22,812, almost triple the national median. Meanwhile, the Phoenix family pays $7,576, about $400 less than the median. A similar comparison could be drawn of Boston and Atlanta, not to mention New York and almost anywhere. So when a Con promotes 'conservative economics and policies', this is what he is advocating, he wants to turn the entire country into a large Missisippi or Alabama with dumb bigots who had sexual awakening with their sisters talking up family values and how their trailer trash is better than a homeless Haitian because Trump University Dean is MAGAing with his golf trips and bitching like a teenager on twitter. That's modern conservatism for you, the kind Goldwater feared would destroy the Republican party. I found towns in South Carolina, Alabama, Mississippi and Arkansas that looked like towns in Zimbabwe, just as overlooked and beleaguered. It’s globalization, people say. ... To me, globalization is the search for a new plantation, and cheaper labor; globalization means that, by outsourcing, it is possible to impoverish an American community to the point where it is indistinguishable from a hard-up town in the dusty heartland of a third world country. The devil is in the details. It is important to understand the methodologies employed in determining the validity of any statistics. In addition, when certain metrics are left out, such as crime statistics or climate considerations, one can paint an inaccurate picture of living conditions in an area and resident motivations to stay there. Futhermore, one has to watch certain metrics that may have subjective interpretation. It is critical that certain standards are agreed to before presenting statistics as facts. Another factor to consider is how to account for commuting in statistics. Do the most productive people live in the suberbs? Also, much is made by the Left on how “prosperous” California is. However, I wonder if Right is just carrying a greater than usual share of burden in California versus other states. Oregon, Washington, Utah, and Texas have been the main beneficiaries of California’s bad regulatory and tax environment. There have been lots of new business startups in these state, including technology and supporting industries. I would like to see relative employment growth statistics in these states versus California. Louisianna, Mississippi, Alabama, Florida, South Carolina, and North Carolina are secondary beneficiaries to California’s anti-business environment. For example, large shipping companies find it cheaper to deliver Asian goods in these secondary state ports than California in spite of the many additional miles and days it takes versus delivering in California. California’s CARB rules prevent ships from idling to provide power. Instead, these shiiping companies have to pay seven figure fees to use onshore services. California is becoming a great test case for Leftist policies being at odds with sound governance. 3 killed, 12 wounded on Thanksgiving Day.